The more you discover, the more the Mythos infects your mind. Your friends cannot be trusted, your knowledge means nothing, and everything you hold dear turns to dust. 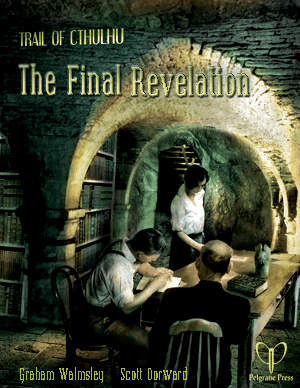 The Final Revelation collects for the first time the four sanity-destroying Purist adventures for Trail of Cthulhu written by award winning RPG writer Graham Walmsley. With a framing scenario by Scott Dorward, The Final Revelation gives your Investigators the opportunity to play through a Purist campaign set in the United Kingdom of the 1930s where there is no escape, no comfort and no salvation when faced with the Mythos. Your Investigators are powerless and insignificant; your only choices death, insanity or a quiet life with a shattered mind. The RPPR crew tackled the Final Revelation, with Caleb as the GM. Find out what happens when we delve into pure cosmic horror and the British class system. Hint: it does not end well. The Watchers In The Sky: The Friday Group uncover documents related to an avian threat that defines explanation. The Dance In The Blood: In a forgotten corner of Northern England, between the rolling hills and tranquil dales nestles a village plagued by terrible secrets and subterranean horrors. The Rending Box: In an antiques shop in North London, there is a box. Inside the box is an ancient creature, seeping through into the world. It will show the Investigators the universe as it really is. Can they survive the final revelation?